I have been so incredibly busy this past week. Between creating new websites and brochures, working on a few wedding invitations, playing trains with a 2 year old, and taking care of daily errands, I haven't had much time to blog. It's been over a week since my last post and I'm going through withdrawal! It's time to end the streak of internet silence and write. What to write about? 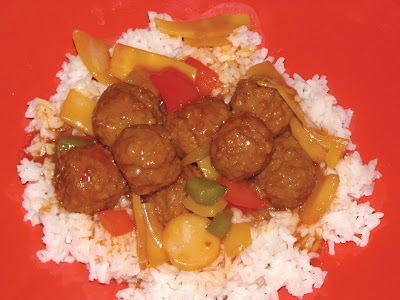 Oh, how about the sweet and sour meatballs I made last week? This was the second time I've made them in the past few weeks and they're pretty darn good. I even got the 'Mom Seal of Approval' on these when I made them for my folks. The right amount of sweetness with the right amount of tang makes for a quick weeknight meal that should please even the pickiest eater. 1. Mix all sauce ingredients together and set aside. 3. Add sauce to cooked peppers and bring to boil, stirring occasionally. 4. Add bamboo and water chestnuts, if using. 6. Cover and simmer over med-low heat for 20 minutes or until meatballs are heated through and sauce is thickened. Stir occasionally. This same recipe can be used with chicken (or pork) instead of meatballs. Dice a few chicken breasts (or boneless chops) and cook in a separate pan with about a tablespoon of oil. When the chicken is cooked through and no longer pink, drain and add to the sauce and vegetables. I like to add a can of bean sprouts to the chicken version but you can pretty much scan the Asian aisle at the grocery store and add whatever you'd like. Enjoy!